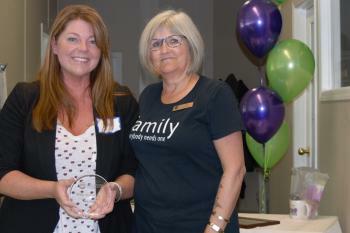 Our 2018 Adoption Award recipients were recognized at our Annual General Meeting on June 9, 2018, in Burnaby. This award is given to recognize the hard work and dedication of an individual volunteer or group of volunteers who have made an outstanding personal contribution to AFABC. Tara has been a volunteer with AFABC for over 5 years. The time and dedication she has put in as a Safe Babies panels and as a buddy parent demonstrates her passion for helping adoptive families. Recognizes a donor who has made a significant and meaningful financial contribution to AFABC. Recognizes an organization or business that has made significant cash or in-kind donations to AFABC. We are incredibly appreciative of SVP Vancouver’s support of our online adoption education programs which has resulted in equal access for rural communities, faster approval of families, and improved family readiness to adopt. SVP Vancouver’s generosity exceeded an amazing $80,000 and continues to help our organization deliver essential education services to families across BC. Know someone who supports adoption? Nominate them for an Adoption Award! Help us help kids by donating or becoming a corporate partner.